"A big THANK YOU to Tyler for having a keen eye in noticing how inoperable/unsafe our overhead garage door was while he was here painting. He was able to fix that as well - now functioning very well and safely too!! He was also able to install a code pad for us too - a wonderful handy man to have around!!" Passion Painters is a small company owned and operated by two Airdronians who love every aspect of running a business. Those same people are the ones who answer the phone when you call; come to your home or business to provide a free estimate; manage and work on your project; and everything else in between. Who are the Passion Painters? LESLEY MARRIOTT (ERICKSON) loves painting! Prior to starting Passion Painters, she owned and operated a painting franchise in Airdrie for 4 years from 2005-2009. For the following 2 years she mentored university students in the student painting industry where she travelled around Alberta consulting on jobs sites, teaching painting skills and business skills. With a Business Degree in Marketing from the University of Calgary, her passion lies in working with people in her community, providing a service that makes them smile! She excels at producing detailed interior jobs, organizing large commercial projects and managing schedules. TYLER MARRIOTT loves painting too! Prior to starting Passion Painters, he also owned and operated his own painting franchise in Calgary for 2 years while earning his Degree in Small Business and Entrepreneurship from Mount Royal University. His passion is entrepreneurship and he loves new opportunities and making changes for the better. He excels at large exterior projects, production of commercial projects and getting work done under tight deadlines! LESLEY and TYLER worked together for several years before starting Passion Painters together in 2011. They wanted to build a brand that stood for honesty, integrity and trust in the community. They combined their experience and expertise in different areas of the painting industry to meet the needs of home and business owners in the Airdrie area. 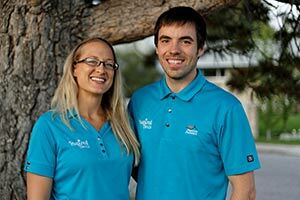 Lesley and Tyler believe in spending time with clients to determine what they want and need, providing detailed written quotes, closely managing schedules, and meticulously inspecting finished projects. These are the reasons that clients continually refer Passion Painters to their friends, colleagues, neighbors and family. In the fall of 2014 Lesley and Tyler made it official and got married! Once the dust settled, they expanded their business to better service the needs of their clients. INSPIRED BLINDS offers high quality blinds and shades and MARRIOTT GARAGE DOORS installs and services overhead doors. "Lesley and Tyler were meticulous in painting, no detail was overlooked, and they both take great pride in their work."